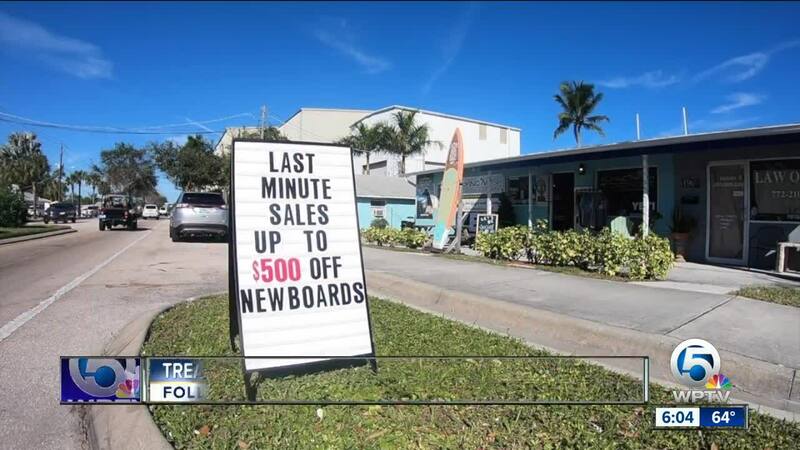 MARTIN COUNTY, Fla. — Back on Black Friday, WPTV spoke with several Treasure Coast small businesses hoping for a big rebound after as dismal Summer of water issues affecting their bottom lines. At Flying Fish Paddle Sports in Port Salerno, Danny Robitaille enjoyed a Christmas Eve rush. "Today’s been busy," said Robitaille. "Today’s been a really good day." After a blue-green nightmare this past Summer, he said it’s been solid month. "Truly humbling when people support us when they come here for the little things when they could go to a big store," said Robitaille. Just down the road at Zeke’s Surf, Skate and Paddle Sports, same story for Travis Kindt. "Soft goods, and apparel has been popular," said Kindt. There is one issue they’re running into, even on Christmas Eve. "Still get people asking if the water is good to paddle board in," said Kindt. The good news is these business owners can tell customers that the water has recovered and is clean. They’re all hoping the momentum keeps going and both recover quite nicely. "Great that we had a very busy day and I just want to say thank you," said Robitaille. "Merry Christmas and Happy New Year if we don’t see you."